Campaign in quaint mountain resorts evinces massive support. 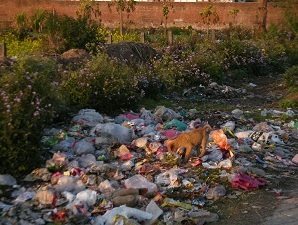 DEHRADUN, UTTARAKHAND (INDIA): Mountain Cleaners and Waste Warriors may sound a bit like fantasy names from the IPL cricket championship, but in reality, they are what they sound: a mission to clean this sylvan, upscale resort of its public defacements and refuse, started by a woman from Britain. “India must be the only country in the world where citizens have no sense of civic pride as the condition of one’s area is the reflection of one’s community. This makes India one of the dirtiest countries in the world,” says Jodie Underhill, 37, who came to India as a tourist in 2008. Underhill has now entrenched her roots to usher in a cleanliness drive in this town, famous also for housing some of the Ivy League of India’s boarding schools, including the Doon School, where many of the scions of India’s rich and elite study. “Indians clean their homes and dump the muck in the public space that they don’t consider their own. We wanted to make the city polythene free, so that this city, nestling in the lap of the Himalayas could regain its natural charm,” says Underhill, known as the “Garbage Girl” in these parts. She initiated Mountain Cleaners (MC) soon after she arrived in Dharamsala, a quaint mountain resort in Himachal Pradesh, in 2008. 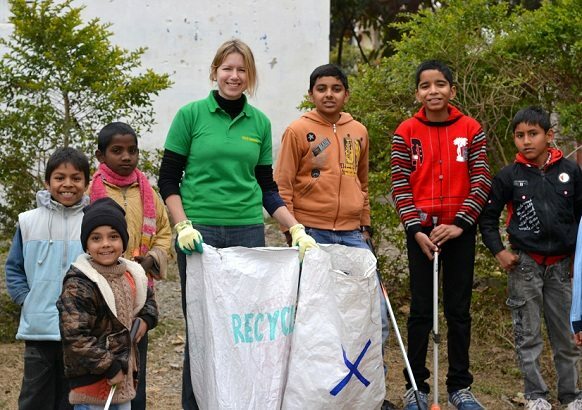 Four years later, she moved to Dehradun and started Waste Warriors (WW), an NGO with the goal of cleaning up India of its garbage strewn in public places. Soon after its establishment, the Waste Warriors swung into action. They organized a clean-up drive with the active participation of the general public. “The idea was to preserve prominent buildings of Dehradun and to take an initiative to stop the defacement of public property,” says Underhill. Public places here are treated with utter contempt by residents: walls of buildings are routinely defaced with posters — political, commercial and promotional. The first target of the Warriors was a government building, the sprawling complex of Survey of India. A group of 20 gathered to scrap illegal posters on the boundary walls of the building. The activity was part of the “Let’s Clean Doon Together” campaign. The group had earlier scrapped posters from the same area, but within a few weeks, the walls were again covered with myriad posters, inundated with those of candidates contesting the local college elections. Waste dumped on the roadside in an upscale locality in Dehradurn. This time, though, Underhill’s group — comprising mostly local youth — tackled the clean-up with a new strategy: they approached government bodies who governed maintenance in town. Vijay Raghav Pant, Director General of Police, Uttarakhand, showed keen interest in the campaign, and helped the cause. The City Magistrate, Harak Singh Rawat, joined the team’s efforts. The District Magistrate, BVRC Purshottam, instructed the staff of the Collectorate to use dustbins on a regular basis, and he gave Underhill a token amount of Rs. 2,500 as a gesture of appreciation. A large number of residents, including students, national and international volunteers joined in the clean-up drive that started from Gandhi Park, the central park in the city, and covered the area from the Clock Tower, the city’s landmark to its major marketing hub, Ashley Hall. “People were thrilled to see, we Europeans cleaning up their muck, and joined us,” recalls Javier, a volunteer from Spain. Gordon, another volunteer from Scotland, echoed the same sentiment. “We chose a particularly ugly wall at Darshanlal Chowk and then obtained permission from the mayor to paint it with an environmentally themed wall mural. The rain made things tough; the sun made us pour with sweat, nothing went smoothly, but guess what, we loved the finished product and it was an awesome experience. We received lots of encouragement and it was certainly worth all the effort. Now, we have permission to paint 10 more murals,” says Underhill. Even as residents exulted in the cleanliness drive, strangely, businesses showed scant support. “After the cleaning drive at Ashley Hall, when we went to ask them for donation, one shopkeeper gave us a laughable amount of Rs. 20, as if were beggars and Kamal Jewelers, a major shop selling gold and diamond ornaments donated Rs. 200, whereas they spend lakhs in advertising,” says Underhill. The Warriors, however, were not daunted, and put up a, exhibition to show another side of waste collection: recycling. A stall “What waste can create” near Survey Chowk, where craft items like cardboard dustbins, and flowers made from egg trays and pen stands, inspired the general public. The team also proposed to make a wall mural on an environmental theme on a boundary wall. Students played a big role in the clean-up. More than 80 pairs of young hands supported the cause, including from Scholar Home, an English medium private school, Sri Guru Ram Rai Post Graduate College and DAV Post Graduate College. “This was essential to raise public awareness; sustaining this drive is essential to keep the city free of garbage, especially that of polythene,” says Sujata Paul Maliah, Board Members of the Warriors. The town’s local people were impressed with the work of the Warriors. “Ban on polythene is a good move. But, they should ban all kinds of polythene carry bags in Himachal (Pradesh) and consumers should have an alternative,” said Anuksha Bisht, a 11th class students at Ann Merry School, a private school in the city. Some doubted how long the efficacy would last. “It’s a great initiative, but I doubt that it will last longer,” said Beena Dobhal, a homemaker. However, the Warriors’ initiative has motivated youth in the area. Another organization, “Making a Difference” (MAD), now conducts clean-up drives and awareness campaigns every Sunday. MAD began their clean-up drive in Ladpur area in the city, dominated by slums, on a Sunday after Diwali. They involved locals, especially students, in their drive and within three hours collected 25 garbage bags with assorted waste of plastic, metals, polythene, spent crackers and daily household waste. “It was a good community drive and people realized the importance of keeping their area clean,” says Abhijay Negi, founder chairperson, MAD. The Warriors also took cleaning-up crusade in Dharamsala, a small and picturesque Himalayan paradise, the Indian abode of Dalai Lama, where many Tibetans joined them. “We decided to watch the teams of India and England on the occasion of the IPL match on January 27 when our team, India, performed a small miracle at the stadium. Our team achieved no less a feat at the end of the match, as it managed the waste of 20,000 people. We recycled this waste as much as possible,” informs Tashi Pareek, Project Manager of the Warriors’ Dharamsala project. The Warriors also declared war against waste in New Delhi and Goa. Hauz Khas area in Delhi was cleaned with the involvement of 20,000 people and beaches in Goa were spruced up with the help of a hundred thousand people, during the Sunburn Music Festival. The Warriors also announced a cleanliness drive and generated an environment awareness campaign in the high altitude Manimahesh Lake in Chamba district where waste was left behind by growing number of pilgrims. The 2012 event was, however, cancelled, because of lack of support. “We were shocked to see the pile of garbage these pilgrims leave at the abode of God that they don’t consider their own. Foreign trekkers who visited the glacial lake last year had warned us about the serious threat the serene mountain lake faces from the amount of garbage left behind by pilgrims and others,” says Underhill. Underhill says she keeps the cleanliness movement running not with money, but with love and support by the local populace. Often she doesn’t have money to pay her office rent and meet basic expenses of her volunteers. The group, however, got a big boost and recognition at the national level when it won the ‘Green Hero’ award by the Center of Media Studies in 2010 and won Times Now’s Most Amazing Indians Award for the year 2012. More recently, they also won the prestigious Mahindra’s ‘Spark the Rise,’ award that supports community projects with monthly grants. The Warriors was one of the eight projects winners and also among one of the four idea winners. “This will make us pay our volunteers for their basic needs and will keep us going,” says Underhill. She has also realized that it is necessary to involve celebrities. She managed to rope in popular Australian cricketer Adam Gilchrist, who reportedly charges Rs. one crore (about $180,000) for an hour’s job, but waived off charges for an advertisement he featured in, advising people not to throw garbage carelessly on public property. However, despite the much publicized efforts, most of the middle class of this town finds no inspiration from Underhill’s dedication. A lot of the residents continue to dump garbage in public space. In the upscale Vidya Vihar colony, this reporter saw a rich businessman, who lives in a three-story house, dump the effluents of household waste into a vacant neighboring plot; reminiscent of the growing problem in Bengaluru.